Early in the morning of 26th April 1986 two explosions destroyed reactor no. 4 at the Soviet nuclear power station at Chernobyl in Ukraine. 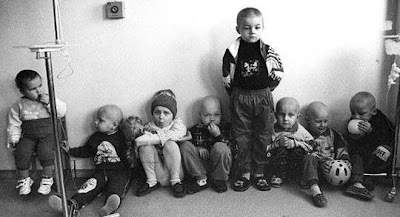 This started the chain of events that led to the world's worst nuclear power accident, and left victims like the children seen above in an oncology unit in the area. 26th April 2007 is Chernobyl Day, and On An Overgrown Path can exclusively reveal that Germany’s Environment Minister, Sigmar Gabriel, is using Mahler’s music to send a powerful message to the country’s parliament. Last year I told the story of the 20th anniversary Chernobyl concert held in Berlin which featured Thomas Quasthoff singing Mahler’s Kindertotenlieder. Sigmar Gabriel is Minister for the Environment, Nature Conservation and Nuclear Safety in German chancellor Angela Merkel’s cabinet. This week, in a dramatic gesture that underlines the terrible risks associated with nuclear power, he has sent all 614 elected members of the Bundestag a CD of the Chernobyl anniversary concert. Herr Gabriel is no stranger to controversy, and he recently made headlines when he accused the United States of blocking progress on two key areas of global environment protection. The Mahler CD was recorded in the famous Philharmonie Hall in Berlin, and the performers include Grammy winning baritone Thomas Quasthoff, and the orchestra of the Hanns Eisler Academy conducted by Christian Ehwald. As well as music by Mahler, Schubert and Mozart the CD includes readings from the best-selling book by Belarus author Swetlana Alexijewitsch titled Tschernobyl - Eine Chronik der Zukunft (Chernobyl - a chronicle of the future), and from the writings of Dwight D. Eisenhower and the philosopher Günther Anders. The benefit concert and CD is just one of many remarkable projects in the twenty-three year history of IPPNW Concerts. They are part of International Physicians for the Prevention of Nuclear War (IPPNW), a non-partisan international grouping of medical organisations dedicated to the abolition of the nuclear threat, who work with the long-term victims of nuclear incidents ranging from Hiroshima to Chernobyl. Their work was recognised with the 1984 UNESCO Peace Prize, and 1985 Nobel Peace Prize. * Buy the Chernobyl anniversary CD online via this link.